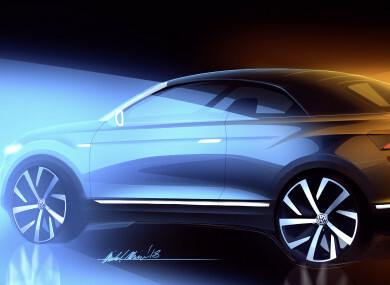 Volkswagen T-Roc Cabriolet set to arrive in 2020. IT HASN’T BEEN all that long since Volkswagen introduced its compact crossover, the T-Roc, to the Irish market. Now the German car maker has confirmed its plans to build a cabriolet version of the T-Roc, due to arrive in 2020. When the T-Roc was initially shown as a concept back in 2014, it was displayed as an open-top small SUV. Subsequently, at the 2016 Geneva Motor Show, Volkswagen showcased the smaller T-Cross Breeze concept, which was a soft-top. Volkswagen is evolving into an SUV brand. The T-Roc is already setting new standards in the compact SUV segment. With the cabriolet based on the T-Roc, we will be adding a highly emotional model to the range. SUVs remain hugely popular, with an increasing number of smaller crossovers coming onto the market. But few manufacturers offer other variants like cabriolets. The Range Rover Evoque Cabriolet was introduced in 2016 but has sold only in very small numbers here. It is hoped that the T-Roc Cabriolet will pick up sales that were lost when the Golf Cabriolet was discontinued. Since the T-Roc went on sale, Volkswagen has received more than 40,000 orders, while its bigger brother the Tiguan shifted more than 720,000 units last year. The T-Roc Cabriolet will be produced in Osnabrück factory following a €80 million investment. Currently, this facility produces the Volkswagen Tiguan and Porsche Cayman, while also providing painted parts for the Skoda Fabia. Email “Volkswagen has announced a convertible version of its popular T-Roc”. Feedback on “Volkswagen has announced a convertible version of its popular T-Roc”.